The advantage of air travel is that travellers save a lot of time and for the same reason people prefer this mode for transportation over railroads and highways. Air travel has come a long way in India as more new airports are being constructed and older unused ones are being revived to accommodate larger aircraft that require longer runways. Airport construction is a highly specialised civil engineering segment within the construction industry and is not limited to the tarmac or the control tower – rather it is a wholesome endeavour in which airport security receives the highest level of priority. India is among the few countries of the world that has a handsome number of airport construction companies. Uniquely, a few of the top airport construction companies in India also handle airport construction jobs in foreign countries as well. This is a major advantage for them and they are able to face construction challenges more confidently. In India there are airports both in the government and private sector with a vast majority of airports under the control of the Airport Authority of India (AAI). In addition to constructing and operating airports; AAI prescribes rules and regulation for construction, maintenance and safe operation of airports. In all, the authority operates 125 airports in India. To meet various regulatory measures any business that wants to construct and operate airports in India has to seek AAI approvals before setting the airport construction process on. However, it is significant to note that no civilian airports (for passenger traffic) can be constructed in places that are within a 150 kilometre of an existing airport. This does not, however, apply to airports that are for private use only. Different airports have vastly different objectives but there are few points on which there cannot be any relaxation. The construction companies should therefore direct their designing efforts to meet not only passenger requirements but also regulatory requirements wholesomely. Here is what sets a great airport apart from others. Airport Security: Airport security should be a high-priority area when constructing a new airport or modernising an existing airport. Security is not all about a great runway; it is more about fencing and cordoning the runway from intruders. A secure airport usually has a specially demarcated area for passengers waiting to board an aircraft and those who have alighted from a haul. It will provide a seamless experience to passengers that will reduce the time required for boarding and waiting for baggage on arrival. Car Parking: One of the major considerations that airports must take into airport construction is car parking. For every aircraft arriving at the airport, there are at least 100 or more cars that come to pick up passengers. A well thought out and the constructed airport will have automated parking lots that can hold hundreds of cars. Airport construction companies must therefore prioritize car parking and other utilities just as much on providing facilities inside the terminal. Ticketing and Boarding Passes: Though most of the ticketing is nowadays done online and few passengers actually buy it at the airport but there still a big number of last-minute travellers who will want to buy or confirm a ticket at the airport terminal. A streamlined well-maintained and the properly designed airport should have a systematic flow of passengers. 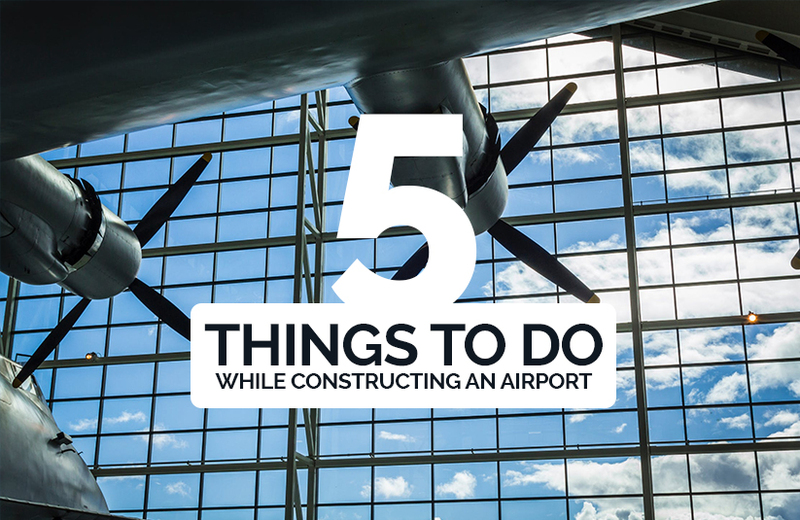 Providing a separate ticketing area should therefore be one of the top priorities of top airport construction companies when they build an airport or remodel an existing one. Visitor Area: This is a tricky thing that many airports lack. The net result of an airport without a proper area for visitors is confusion and security breach. Security breaches are known to affect airport operation negatively. A visitor area with a cafeteria or restaurant is important for both small and big airports. One of the often neglected facilities in airports in India is the waiting area and resting places for transiting passengers. The construction companies should therefore place a high priority for this important requirement. When designing an airport, airport construction must consider including a hotel within the airport. ISB, are a pioneer in the construction and manufacturing of PEB structures for Airport construction across PAN India. They well know players in the Pre-engineering building segment.